All parts to be joined must be cleaned and degreased. The presence of contaminants such as oxides, paint, grease/oil and any other form of contamination, will affect the final result, giving rise to brittle joints and potentially to dangerous metal fumes. During the designing stage, it is necessary to take into account the position of the joint components. In order to obtain a capillary brazing, it is important to have a joint gap between 0.05 and 0.2 mm, depending on the filler metal used. Such a distance should be calculated at the working temperature, depending on the thermal expansion of the materials to be joined. For example, when using a silver alloy to braze a copper bushing in a steel sleeve, we must take into consideration the coefficient of expansion of copper, which is higher than the coefficient of steel; since the latter is the external element of this assembly, there should be a higher tolerance compared with the one necessary in a steel-to-steel joint. The solution is the opposite if copper is the external element and steel is the internal one. When considering tolerances during a brazing operation, we should keep in mind the brazing temperature of the components rather than the temperature in the working environment. use of the capillary force to spread the filler metal on the whole brazing area. 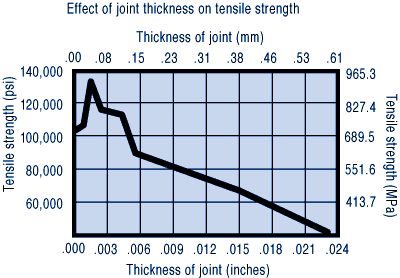 Excessively wide tolerances might decrease this force, preventing the filler metal to penetrate into the joint gap (an alloy with a wide melting range might promote the joint “filling” if the joint gap is wider). 3 – Choosing the right alloy. The filler metal must be selected keeping in mind the brazing operation, and specifically the following factors: the melting range of the alloy, its composition, the materials to be joined, and the exposure to the operating environment. A Safety Data Sheet provides the features of an alloy, as well as information about its general use in the brazing industry. For example, it is important to remember that phosphorus-containing alloys are not suitable for brazing steels or nickel-containing alloys, since a brittle compound might develop, decreasing the mechanical properties of the joint. To avoid corrosion, these alloys should not be exposed to atmospheres containing sulfur. Thus we understand how the melting range of an alloy is only one of many factors to consider when choosing a filler metal. A flux provides the proper protection from oxides during a brazing operation. The choice of the right flux is based on several parameters. First, it depends on the base metals, on the filler metal and on the working temperature, since the flux is effective in a specific temperature range. It is important to select a product with a minimum working temperature of 50°C below the solidus temperature of the alloy. The duration of the joining operation also affects the flux life and therefore the choice of the right type of flux. Fluxes are available in powder, liquid, paste or gaseous form; the latter is called Gasflux, and it is used exclusively in torch brazing. The flux enriches the fuel gas, and it is transferred to the piece directly through the torch. Another practical solution involves the use of coated brazing alloys with the flux already “coupled” with the filler metal. Brazing fluxes are classified according to their characteristics and applications; they are regulated by European Standard DIN EN 1045. After choosing the appropriate flux, it is important to use a sufficient amount of it in order to provide an adequate protection to the overlapping area during the whole brazing cycle. It is appropriate to apply the rule “melius abundare quam deficere” (literally, “it is better too much than not enough”), since a low amount of flux (or a diluted one) would have a short protective action –at the expense of the alloy fluidity– with the risk of incorporating oxides in the liquid braze. Also the quantity of filler metal should be chosen reasonably, since a small amount could result in an incomplete joint, and an excessive amount would cause a waste of resources. During manual brazing it is important to jig the components. To ensure a good joint, the parts must remain steady when the filler metal starts to solidify. On the other hand, moving the parts when the alloy is in the liquid phase helps the outflow of the trapped gas. Manual brazing is usually performed with acetylene torches or with other fuel gases like propane, methane or hydrogen. Torch brazed joints must reach the melting temperature of the filler metal as quickly as possible, to avoid microstructural changes of the material. The brazing process must be completed in a suitable time with regard to the flux life. The latter is limited both by temperature and heating time; beyond these limits, the flux will be saturated with oxides and its effectiveness will decrease. During the heating stage, the joint area should be heated uniformly. If the components have different thicknesses, the part with the greater weight is heated first. When the materials have a different thermal conductivity, it is advisable to heat first the component with the lower conductivity, since it absorbs less heat. If the heating is insufficient or there is a thermal difference between the components, the overlapping area will be brazed in a discontinuous way, giving rise to a brittle joint. The cooling stage is also critical: the solidification shrinkage due to different coefficients of thermal expansion of the components might introduce stress concentrations that lead to cracking. The filler metal can be placed in the joint area or applied when the brazing operation begins. In the latter case, the filler metal is applied when the working temperature is reached. When a brazing rod is used, it should be protected by a flux. If the brazing material and the flux are preplaced, it is important to verify that the alloy becomes completely melted, because the components and the jigging elements might absorb a significant portion of heat. The flux residues can be removed either using hot water or mechanically (by brushing or sand blasting). It is required to remove flux residues in order to avoid corrosion. 10 – Separating a brazed joint. once the brazing alloy is in a liquid phase, it will be easy to separate the components. After this procedure, the parts can be brazed again. J.F.D. Brazing Division offers its experience and solutions to meet specific joining requirements and to ensure the customer satisfaction. Our expertise allows us to compete on the market, thanks to our high-quality alloys manufactured in Italy, in compliance with the most relevant European and International Standards.